The shift from paper-based patient records to electronic medical records (EMRs) is now recognized as integral to the evolution of the delivery of care in family medicine . As EMR tools are further developed, new possibilities for their application come to light: for example, data collected through EMRs can guide system-wide decisions and inform research. 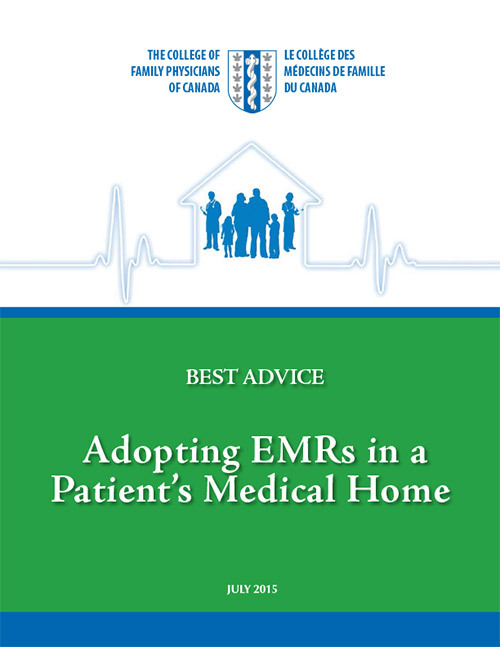 This Best Advice guide, part of the CFPC’s Patient’s Medical Home (PMH) series, provides practical advice for health professionals on what to consider when adopting an electronic medical record (EMR) system. This document provides family physicians guidance on how to adopt EMRs in family practice settings, by discussing three topics: what is an EMR, what are the benefits of adopting an EMR system, and what factors need to be considered when adopting an EMR system. While this paper is presented for consideration by all in family practice, the use of EMRs is a key pillar of the CFPC’s Patient’s Medical Home model. This guide will focus on the basic advantages of EMRs and the adoption of new technology. Future guides will build on this foundation to explore EMRs’ use and their potential in more depth and detail.